Getting employees paid can sometimes be a significant problem, especially for those workers who do not have bank accounts. Some of these employees also have a hard time getting a check cashed and check cashing services can be difficult to find and expensive. Even an employee with a bank account may sometimes need to get their pay sooner than it takes to generate a check, mail it, have it received, deposited, and cleared by their bank. To solve these problems Bridgeware teamed up with The Money Network to seamlessly integrate a debit card payment system right into their TempsPlus staffing software. So now, with one click, your employee can have their pay transferred to Bridgeware’s IPay Cash Card and have cash instantly available to them at over 300,000 ATM machines nationwide. And, not only is there no cost but your company saves money on checks, envelopes, printing, preparing mailings, and postage. When you consider several employees over many pay periods, these savings can be substantial. 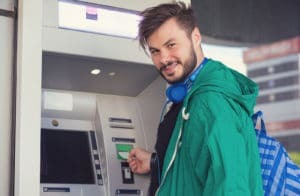 This method of payment is not just for employees without a bank account or needing their pay quickly; other employees love this method of getting paid too.